Manila, Philippines - A die-hard KathNiel fan Eufritz Santos performed Ogie Alcasid's song "Hanggang Ngayon" during the blind auditions of ABS-CBN's top-rating and Twitter-trending singing reality show aired on Saturday, June 14, 2014. "Fan po ako ni Kathryn Bernardo and Daniel Padilla. Ang sweet sweet po nila, grabe! Crush ko si Daniel," Eufritz said. Eufritz wowed the judges with the three judges Sarah Geronimo, Lea Salonga and Bamboo Manalac turned their red chairs. 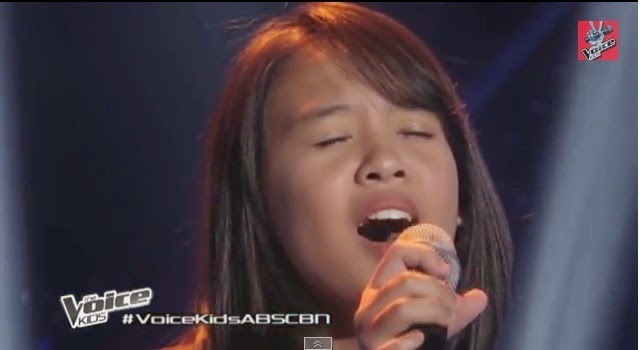 Eufritz chose Lea Salonga as her coach. Eufritz Santos is the 9th 3-chair turner on The Voice Kids Philippines. Other artists who are included in the elite list of 3-chair turners are Jimboy Garcia, Darlene Vibares, Nathan Bautista and Echo Claridad , Arianna Ocampo, Isaac Zamjudio, Mitz Tanguilan and Giedie Laroco. The Saturday's episode of 'The Voice Kids' dominates online conversations with '#VoiceKidsABSCBN', 'Eufritz' and 'Don Angelo' among the top trending topics.